I understand the outrage of honest citizens who went out to protest against Mohamed Morsi on June 30 only to have their efforts branded a coup. When you’re in the middle of a crowd of boisterous humanity that stretches farther than the eye can see, nothing exists outside of that overwhelming reality. The feeling of mutual recognition and collective empowerment erases all context and constraints. As well it should. You don’t go to a protest to think carefully or make necessary distinctions. But when you exit the protest and survey the big picture, you do have to face inconvenient facts. One such fact is that the protests were unscrupulously appropriated and packaged for ends I’m pretty sure many protesters find abhorrent. A genuine popular protest and a military coup aren’t mutually exclusive. The massive protests of June 30 came in conjunction with a much larger scheme that began very soon after Morsi took office. This long term project by entrenched state elites seeks more than simply ejecting the Muslim Brothers from power, although that’s a highly prized outcome. The overarching goal is to systematically reverse each halting step toward subjecting the state to popular control. As Leon Trotsky wrote long ago, in the aftermath of an uprising state managers will gradually push away the masses from participation in the leadership of the country. Popular depoliticization is the grand strategy. The amazing breakthrough that was the mass mobilization of January-February 2011 shook the grip of the ruling caste on the Egyptian state and toppled its chief, Hosni Mubarak. But, alas, it did not smash that grip. The web of top military & police officers and their foreign patrons, the managers of the civil bureaucracy, cultural & media elites, and crony businessmen firmly believe that ruling over Egypt is their birthright, and its state is their possession. The frightful specter conjured up by January 25 of power-rotation at the top had to be exorcised once and for all, principally by habituating Egyptians into thinking that regular political competition over the state is tantamount to civil war. It’s soothing to believe that a popular uprising ejected an incompetent Islamist president. It’s not comforting to point out that a popular uprising was on the cusp of doing so, until the generals stepped in, aborted a vital political process, arrested the president, and proclaimed their own “roadmap” for how things will be from now on. The constant equating of democracy with disorder and the positioning of the military as the stabilizer and guarantor, this is the stuff of the resurgent Egyptian counter-revolution. In thinking through the trauma of Morsi’s ouster by military coup, I want to focus on four vignettes from the last year that complicate the too-neat story of a heroic popular uprising against an unpopular president. These are the August 24 anti-Morsi demonstrations; the broadening of the anti-Ikhwan coalition in October; the theatrical foray by General El-Sisi into the political arena in December; and the military’s Machiavellian appropriation of the June 30 protests to activate their coup d’état on July 3. Together, the four snapshots show not a plot spun by a mastermind but an alignment of disparate interests to oust a common enemy: the first outsider president elected from below, not handpicked from above. The fact that this man belongs to the historically excluded counter-elite of Muslim Brothers was an excellent bonus. This made it easy for the ruling caste to draw on a deep reservoir of societal antipathy to the Ikhwan, gleefully casting Morsi as the crazy-theocrat-dictator-in-cahoots-with-the-Americans-and-Qatar-who-will-steal-your-secularism-and-ban-your-whisky. Had it been Abdel Moneim Aboul Fotouh or Hamdeen Sabahy or any other outsider president, executing the ouster would’ve been a lot harder but the objective would’ve been the same. Outsider presidents with no loyalty to the ruling bureaucracy will fail. Insider presidents can stay, provided that they protect the purity of the ruling caste and secure its privileges. At the time, these manufactured protests against Mohamed Morsi and fronted by Tawfiq Okasha and former MP Mohamed Abu Hamed were laughed off as the ravings of unhinged lunatics working for the security services. 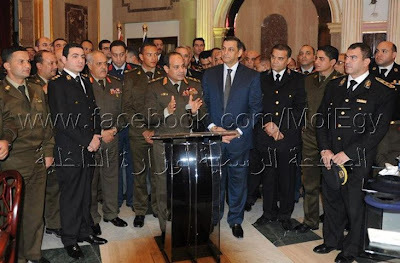 In hindsight, the event was the deep state’s first revenge thrust against Morsi for activating his presidential powers and wading into the farthest reaches of the deep state, firing intelligence chief Mourad Mowafi and other officials, and a few days later retiring the senior SCAF generals and fatefully promoting Gen. Abdel Fattah El-Sisi to Defense Minister. The protests launched the campaign to depict Morsi and the Ikhwan as a sinister cult bent on “infiltrating the state.” This of course is an upgraded version of the Mubarak-era canard of the Ikhwan “takeover” of any institution where they won seats in fair-and-square elections, especially in professional unions. “Brotherhoodization of the State” also made its first appearance in August, quickly migrating to the center of political discourse and becoming a main battle cry of the June 30 mobilization. Simply run your eyes down these 15demands of the August protests mouthed by Abu Hamed to see the origins of the claims hurled against Morsi and the Ikhwan even now after his removal. 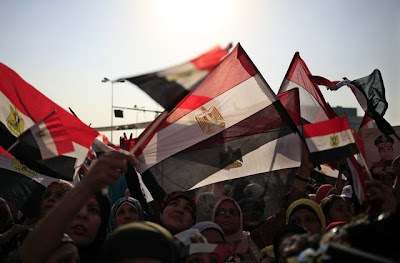 The protests ultimately drew a small turnout and were quickly forgotten, but they planted the seed that Mohamed Morsi was unpopular and not to be trusted with steering the Egyptian state. 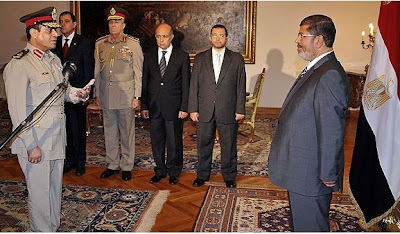 Conventional wisdom has it that Morsi antagonized everyone with his Nov. 21 decrees that revealed dictatorial intentions. In fact, the anti-Morsi mobilization decrying his “monopoly on power” and “Islamization of the state” started a full month earlier in October. A large protest on October 12 dubbed “Accountability Friday” was organized in Tahrir to decry presidential performance after the first 100 days and demand a different constituent assembly. Panicked Ikhwan leaders bussed in their supporters for a counter-demonstration in the square. The sight of pro- and anti-Morsi protesters clashing violently that has become so routine now made its first shocking appearance on that Friday. Islamists tore down the Tahrir stage of Morsi critics, and the FJP headquarters in Mahalla were stormed and torched. Once political conflict took on this street depth, the anti-Morsi coalition grew from a risible revanchist fringe to virtually the entire secular political class and its constituents. Hamdeen Sabahy, Mohamed ElBaradie, and Amr Moussa, who were left in the lurch after the presidential elections now found their footing as figureheads of facile opposition, indulging in reflexive criticism of Morsi rather than the hard work of scrutinizing his policies. Another crucial player joined the bandwagon of the president’s adversaries in October: lots of judges. Morsi’s first attempt to remove Prosecutor-General Abdel Meguid Mahmoud (a constant revolutionary demand) threatened deeply entrenched Mubarakist judges and catapulted Ahmed al-Zend to loudly lead this faction. And the Supreme Constitutional Court as an institution objected to its place in the draft constitution, reprising its never-ending conflict with the Islamists since Mubarak’s ouster. Media covered the political conflict in alarmist tones, and was a conduit for deep state messages. 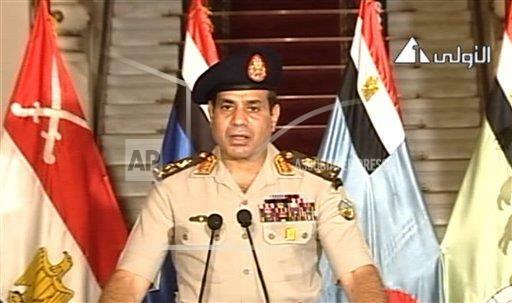 A major daily “leaked” a supposedly top-secret intelligence document reporting widespread discontent at worsening economic conditions “that threatens national security.” The language of “endangering national security” is a recurrent trope in all of Abdel Fattah al-Sisi’s speeches this year, including his 48-hour ultimatum of July 1. The October report warned that “citizens are eager for political participation, but fear single-party dominance of the political process.” Read: the Ikhwan are taking over. Instead of containing the widening anti-Ikhwan coalition, Mohamed Morsi either underestimated or belittled the gathering opposition to his rule and chose to forge ahead. On November 21 he promulgated a decree that blocked the courts from dissolving the constituent assembly and the upper house of parliament. But rather than spend time persuading the public that he was confronting entrenched interests threatened by the set-up of new institutions, Morsi essentially dumped the decrees on us as you’d drop leaflets from an airplane on a bewildered civilian population. This left the arena wide open for his now diehard and empowered opponents to spin a narrative of a dangerous power grab by a dictatorial theocratic president. The massive street demonstrations against Morsi in November & December crystallized the trends that surfaced in October and revealed a new element: serious friction in the police-president relationship. Police were ineffectual or absent when more FJP headquarters were attacked across the country. Morsi and Ikhwan powerbroker Khairat al-Shater suspected that police were making themselves scarce around the presidential palace to allow protesters to storm it. Feeling double crossed by Ahmed Gamaleddin, the Mubarakist Interior Minister that Morsi had appointed as a peace offering to the police fiefdom, Morsi and Shater panicked. In a disastrous decision, they sent their cadres to violently break up the protesters’ sit-in outside Ittehadeyya Palace on December 5. At that moment, the deed was done. The security apparatus had the Ikhwan right where it wanted them: a sinister cabal that had hijacked the Egyptian state and sicced its ruthless private militia on anyone who dared protest. In what has to be one of the more surreal scenes in the Egyptian revolutionary saga, leaders of the state’s coercive apparatus held a press conference in which General El-Sisi extended a formal invitation to all parties, including the president, to gather round the general’s magnanimous table for a healing national dialogue. Flanked by Gamaleddin, El-Sisi acted the sage monarch, calling his fractious flock to order. The dialogue never took place because the presidency sputtered its objections, but the blunt message got through: the president was not in full control. Between December and June, El-Sisi struck out on his own, periodically issuing portentous warnings about the impending collapse of the state. Another surreal scene was the military’s use of the June 30 protests to put on a grotesque display of military prowess. Fighter jets flew above Tahrir Square, not to intimidate the massed citizens into going home as in 2011 but to package their mobilization as an assent to military rule. The planes streaked colors of the Egyptian flag in the sky and drew giant high schoolish hearts (never underestimate the mawkishness of military PR). Helicopters dropped flags on the masses, lending a martial visual uniformity to an essentially diverse populace. Posters of General El-Sisi were held aloft. Police officers in their summer whites gleefully engaged in protest, some theatrically revealing Tamarrod T-shirts beneath their uniforms. Aerial footage (only of the anti-Morsi crowds, of course) was sent to anti-Morsi television channels, which broadcast it to the tunes of triumphal cinematic music. Naturally, the protests of those icky other people didn’t exist. A military plane was put at the disposal of a film director who’s a fixture of the anti-Morsi cultural elite, presumably to make a movie about “Egypt’s second revolution,” as State TV swiftly christened the June 30 protests. The equally massive January 25 2012 protests against military rule are conveniently dropped from this emerging canonization. The revolutionary invention of the Tahrir Square protest as an authentic political performance was recast as state-sanctioned spectacle. The next act of the pageant was to control the message. Officials enlisted media personalities to banish the term “coup” and hound anyone who used it. A few hours before General El-Sisi’s declaration of the coup on July 3, Egyptian media luminaries were contacting foreign media outlets to insist that they not call his imminent announcement a coup. Military spokesmen and anti-Morsi activists repeatedly and defensively asserted that “15 million protesters” and “30 million protesters” had come out on June 30, not citing the source of their numbers. A former police chief called the numbers "unprecedented in Egyptian history." A giant message saying “It is not a coup” was reflected with green laser on the front of the Mugamma building in Tahrir on July 5. 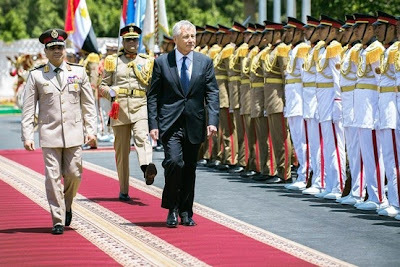 With their July 3 coup, Egypt’s new military overlords and their staunch American backers are playing an age-old game, the game of turning the public against the ineluctable bickering, inefficiency, gridlock, and intense conflict that is part and parcel of a free political life, so that a disillusioned, fatigued people will pine for the stability and order that the military then swoops in to provide. The acute but generative political conflict during Morsi’s blink-of-an-eye presidency was constantly amplified and then pathologized by the jealous custodians of the Egyptian state, with their repeated invocations of civil war and mass chaos to frighten people away from the vagaries of self-rule. Like clockwork every few months, state agents facilitated the conditions for collective violence, dispatching provocateurs to demonstrations, removing police from the streets, standing back as communal violence broke out, resisting civilian oversight, and then ominously forecasting an impending breakdown of social order. The message is clear: left to your own devices, you will kill each other. The ethos of collective self-confidence, cross-class cooperation, religious co-existence, and creative problem-solving on such magnificent display in the January 25 uprising spells the beginning of the end for the ruling military and civilian bureaucracy. So it had to be replaced with a manufactured mood of resignation and “realism,” the false realism that says: accept tutelage or face chaos. And that is the essence of the anti-political doctrine that worships order, fears political struggle, mistrusts popular striving, and kowtows to force majeure.